If you’re not familiar with Joe Cocker, he was a HUGE rock star and songwriter in the 60’s, 70’s and 80’s and had many big hits. These days, people talk during performances–(and usually very loudly). If this sounds like a rant, it is. These people sitting behind us Sunday evening at the concert (and just about every other event like this we’ve attended in the last year or two) weren’t following our “rule” of being quiet during a performance. We came to listen to the music and they came to socialize with each other. But we did it BEFORE the concert and not during it. *The two of us have made it all up that people should be quiet at a concert and get off their smart phones and Facebook. *The two of us believe that our way is the “right” way. And this is all based only on our thinking. We’ve discovered that this is the way it is in every aspect of everybody’s relationships and lives. You, we and everyone else thinks and believes there is a “right” way and a “wrong” way to see things, do things or behave in certain situations and it’s ALL based on individual preferences. Now that doesn’t mean that we have to sit back and do nothing when clashes in preferences appear. But sometimes we don’t say anything when we’re in this kind of situation. The point is that knowing that the other person just has a different way of looking at the same situation than you helps to soften it so the two of you can find some common ground. No chance of finding a resolution that everyone can accept. You can make a simple request (as Otto did) or you can even not make a big deal out of it and let it go. The truth is that you’re always ok, no matter what is going on in a situation. It’s just that your mind tries to trick you into thinking you’re not. Understand that in that moment you’re acting out of “rules” you’ve made up about how things are supposed to be. Notice two things about what we just said about preferences or “rules”…..
(2) If you’re open to it, there may be another way of seeing the situation. Please know that we’re NOT saying that you should compromise your values or turn yourself into some kind of emotional pretzel to just try to keep the peace or to love (or be loved by) someone. 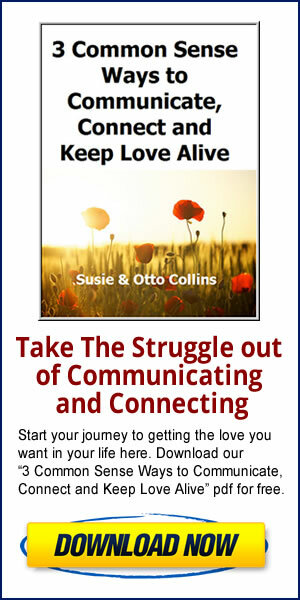 We’re trying to show you how much of our inner world in love and life (both the good and the bad) is just something we’ve made up in our heads.